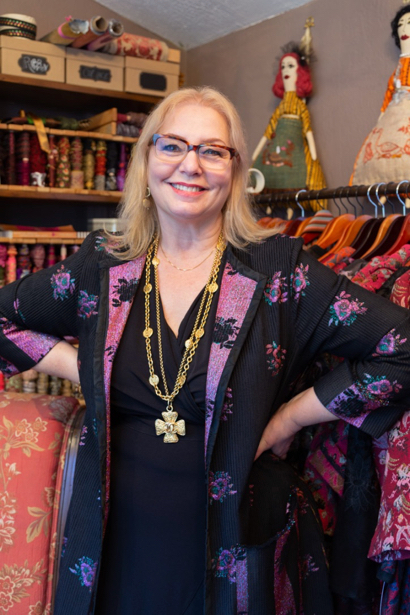 So, it’s not surprising that her shop at the Allied Arts Guild is filled with what she describes as “wearable art jackets” made from French brocade. This is Aida’s second location in Menlo Park. She had another shop downtown near what is now Chef Kwan’s. But her work began in Dallas in the ’80s, although her craft had its roots in her native Syria. Aida’s mother is American, and she came to the United States when she was in her 20s. The International Women’s Club sponsored her first collection with she was 29. Soon her clothes could be found in some of the finest boutiques in the country. She’s proud that all of her clothes are made in America. The fabrics come from France with trims either French or Italian with handcrafted buttons sourced in Florence. The various bridal seasons bode well for her business as her clothes are in demand by the mother of the bride and mother of the groom. Custom jackets run between $300 to $500.